It's time for another fun challenge over at Frilly and Funkie! Thank you so much to everyone who played along with me for the Valen-Twine challenge! I was just drooling over all of the romantic, shabby and vintage projects that you made! You made it really difficult to pick a favourite! This time Sue is our lovely hostess and she has chosen the theme WINTER BLOOMS. Even though it's the middle of winter, she would like you to take this opportunity to create our own flowers! So, whether you make roses or paper daisies, let's see lots of handmade flowers on your project! Here is my make. Since it is still winter time where I am, I thought I would do something a little different with my flowers. Something a little darker in colour and deeper in dimension. 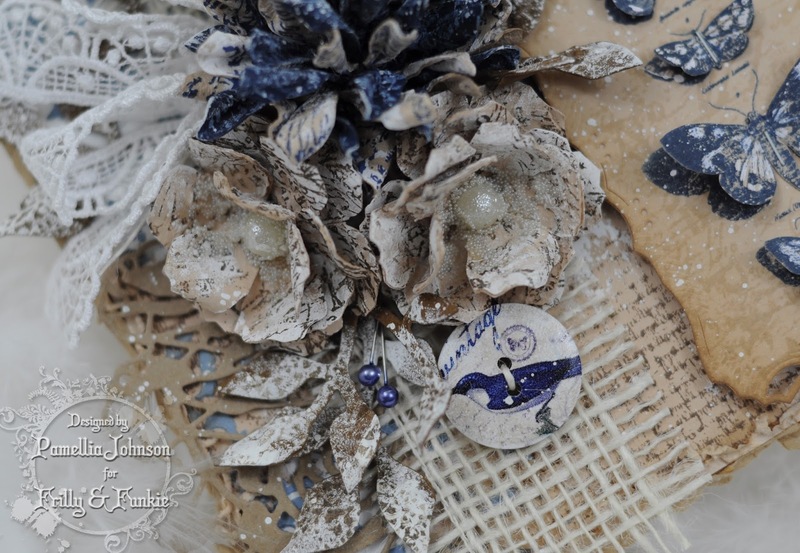 All three flowers are made using the Tim Holtz Tattered Florals die. 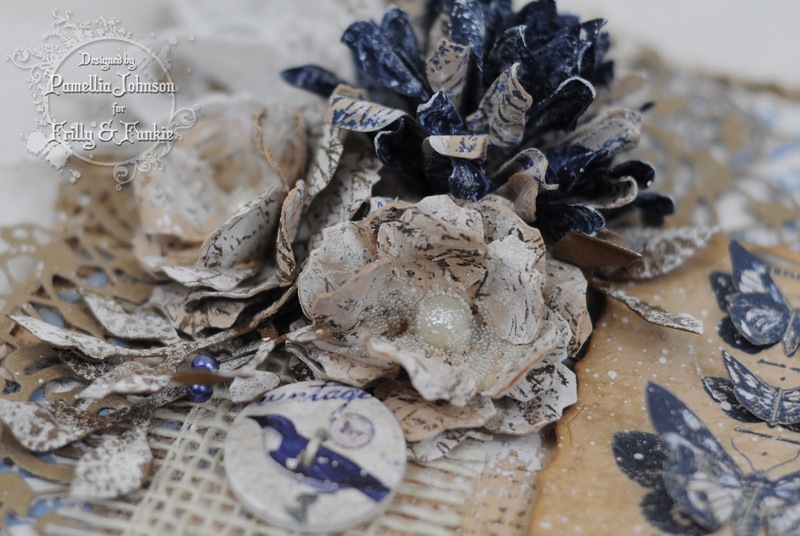 I used the script stamp from the Tim Holtz Papillon stamp set to add a design to the petals. I used Ranger Archival Potting Soil and Cobalt for the neutral petals and Ranger Adirondack Snow Cap for the blue petals. The leaf flourishes were cut using Tim Holtz Garden Greens. I dabbed all of the leaves with some Picket Fence distress paint so I would have some areas to stamp on. 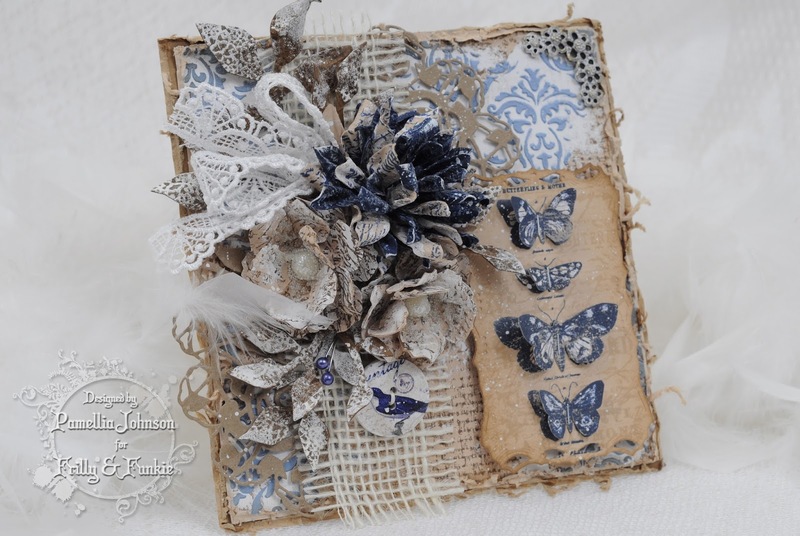 The beautiful doily die is from Prima. The button and blue pins are from my stash. For the background, I stamped a Hessian design from Kaisercraft onto kraft paper and then used some White Gesso to cover some of the areas. I tinted some home-made texture paste using Wendy Vecchi inks, a mix of Forget-me-Not and Sky Blue re-inkers and then applied it through the Tim Holtz Gothic stencil. The beautiful flower corner piece is from Linda's shop, The Funkie Junkie. It's bronze, so I used a little Adirondack Alcohol ink Snow Cap to shabby it up a bit and make it look antique. In keeping with my New Years resolution, I pulled out a never-before-used Spellbinders die from the Noble Rectangles set to make the base for my butterflies. I stamped the script stamp with Brushed Corduroy, then edged it with Gathered Twigs. I flicked a bit of water and a bit of Picket Fence with the end of my brush. 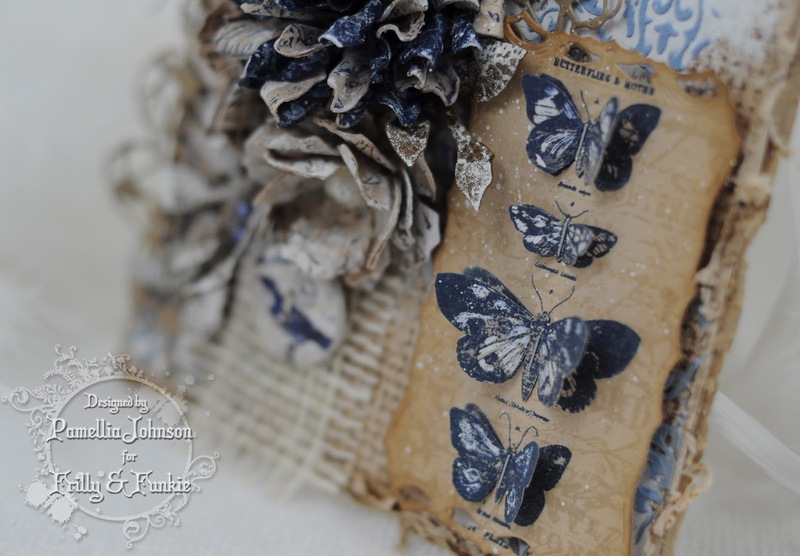 I stamped the butterflies once directly on the base using Cobalt and then again on scrap paper and fussy cut them out. I did a bit of highlighting with a white pen and then attached with my Tiny Attacher from Tim Holtz. This gorgeous lace is also from Linda's shop! Isn't it just absolutely luscious!! Did everyone notice my beautiful new watermark?? Designed by Linda herself, I just love it!! I would just like everyone to know how much I appreciate everyone who takes the time to visit and leave a comment! Up to now I have always tried to say thank you to everyone, because I wanted to make sure you know how grateful I am. Unfortunately, I mow find that I am having a hard time keeping up with so many wonderful comments, so I am going to have to limit my responses to answering questions. I hope everyone understands and I hope you realize that I still read and appreciate every single comment...and please feel free to continue to ask your questions. I will always take time out for answers. Thanks again to everyone for your support and I send big hugs out to all of you. This beauty is very rich in wonderful details. Beauiful creation, Pamellia. This is stunning Pamellia. I really love the colours, beautifully detailed flowers and wonderful textures too. This is beautiful Pamellia, I love the colour combos, one of my favourites!! I am very in love with this card, I can't stop looking at all the beautiful detail. A stunning creation yet again and one that we can only look at in awe - superb design. Stunning creation Pamellia such a wonderful design, amazing work. Another beauty - LOVE the colors!! That shade of cobalt blue is so gorgeous here with the vintage brown hues. Your flowers are fantastic and the blue stenciling is such a lovely touch. Wonderful way to work in the lace and the burlap too! Your creations are always amazing! Thanks for giving our visitors such fabulous eye candy! What a jaw dropping creation!! Love the color combo! Blue is my favorite color :) Stamped flowers are gorgeous and the butterfly section is fantastic!!! Love that stencil background, I am a big fan of damask pattern! Just stunning! I could go on and on so I'll just say BRAVO!!! Hugs:) and see you on the dance floor my friend! I think this has to be my absolute favourite of everything you have done - at least today it is but I know that will change. I love, love, love the colour combination and the wonderful combination of elements. The script flowers are stunning and the treatment of the butterflies is so fanciful and fun. GORGEOUS!! This is so beautiful. Thanks for joining us over at TTPH for this week's challenge. This is just gorgeous!! I love how you did the flowers! Grungy and beauty. What a make! Bubbles your cr stove genius knows no bounds! What an awesome project and I am really diggin the darker colors. Love the watermark as well. Hugzzzzz! Your colour palette on this is so elegant Pamellia and reminds me of Wedgewood Pottery. Such a beautiful design as always. Thanks for the comments you have left me on my blog and at AVJ, much appreciated. Beautiful Pamelia! love all the details that you so perfectly add to your designs, fabulous work! Wow! 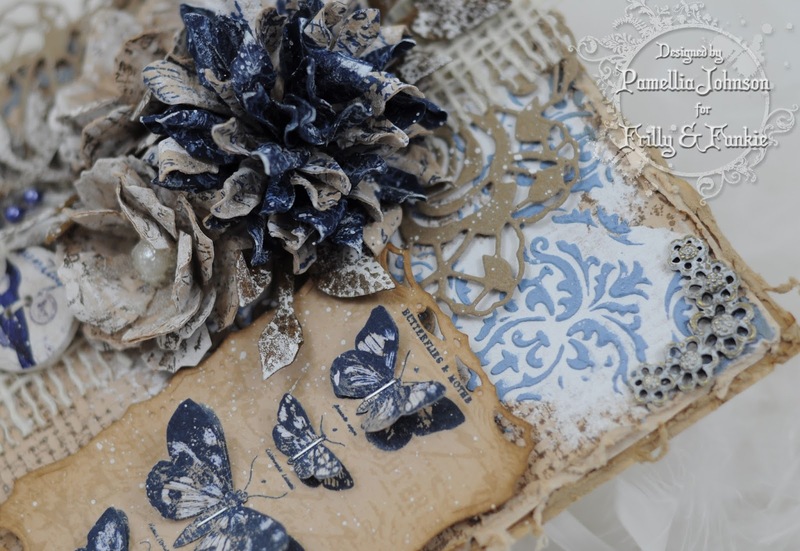 Another stunning creation Pamellia, your flowers are gorgeous and I love the dark blues with the Kraft. Fabulous details and dimension as always - a beautiful make. Another stunning project Pamellia, the flowers are gorgeous. I am so delighted with this card! I love the combo of the neutrals with the blues...I see Michaels is getting on the denim bandwagon, and I just could not resist picking out a few things. This color combo is in my craft line-up (hopefully before the end of the month!). You have given us all plenty of inspiration, with your card full of details and yummy texture! 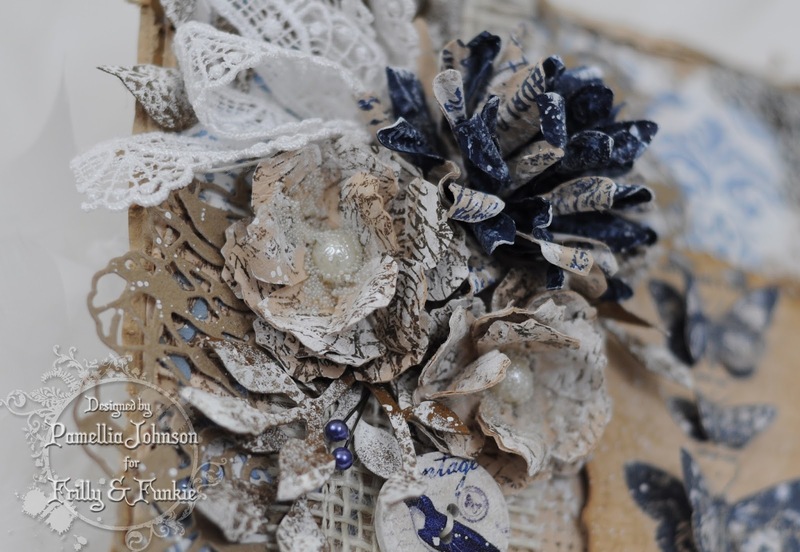 I love the little stick pins, the button and of course, your flowers, so full and shabby! Again, those micro-beads are the best! And your butterflies are just fabulous! This is not a question...but don't you just love that picket fence splatter! I love it on your card here, but I'm getting a little tired of cleaning up after my basting brush! Another great design! And yes, I love the watermark! And I think it just fine you not leave a reply--you are one busy lady! But I for one, will miss "hearing" your sweet remarks. I'll just have to make more stuff so you can leave one of your lovely comments on my blog:):). Big warm hugs!! Wise decision to stop replying Pamellia, not so bad if you are only getting a couple of comments but you my lovely Sparkle Fairy are now mega busy and for that we are all grateful, more of your wonderful inspiration to see! Wonderful project! Thanks for the inspiration! It's another totally out of this world card Pamellia! I adore the slightly darker colour tones and all the wonderful techniques you have used! The coloured texture paste looks amazing! I have always wondered a bit about the fact that you answered each and every comment you receive...I don't think many people would come back to see them anyway. I also am pretty certain that most bloggers know how much we all appreciate the people who take the time to comment on our projects, so I think you made a wise decision! Much better to spend your time crafting and sharing your beautiful work with us!!! Better late than never! :-)) I too think this is beautiful. You do shabby so well! I like the wee little button with the bird on it tucked in there. And everything else! I completely understand about replying to comments, it must take you forever. You need that time for more crafting or just daily life. I do appreciate that you try to answer questions, I have asked a couple. And the watermark is beautiful, I had noticed it. Hugs back to you. I can't take my eyes of this awesome stunning creation, Pamellia! And the colors - one of my favorite color combination! I love your flowers and butterflies! Love, love, love this! Gorgeous!! I am really loving those colours!! Pamellia, your Winter Blooms are out of this world gorgeous! Love all the shabby chic goodness and lovely touches. Makes winter just warm the soul! Hugs! WOW this is stunning Pamellia! 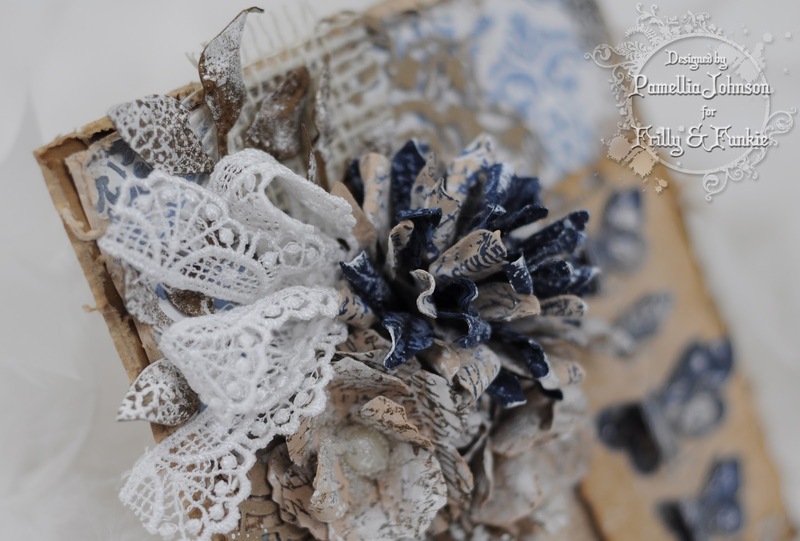 I love the rich blue colors and all of the details, that lace is gorgeous!! this is so superb as usual. Love all the stunning winter blooms, and your very superb design on the amazing creation. I just love to see you new projects every time I visit. such an awesome card, Pamellia. This is a masterpiece! Everything in this creation is stunning...color, design, flowers,details! WOW! Such a cool card you have made....LOVE it! Playing catch up after a busy day yesterday. Thank you so much for your kind comment about my niece. Love the wintery tones and your flower has wonderful dimension. Fingers crossed for your challenge entries. I did think you would be spreading yourself thinly, my friend, with the kind way you reply to everyone. As Pamellia Fever is now reaching epidemic proportions, you must spend an age doing it. Its marvellous that you have graciously done that but time to have some more time for yourself. PS. . . . Pamellia Fever is one of the better things I have caught over the years. I take 2 spoons of distress ink everyday but I think I have it for life lol! I love how all the elements come together on this project, it looks amazing. Thanks for joining us for Perfectly Rustics's Wings Challenge. Cathie DT. These blooms are gorgeous, I love the script and dark blue shades -they look fabulous. Your new watermark is so sweet and very professional looking. Your Winter Blooms are simply stunning! I LOVE the colours! Thank you for sharing your beautiful card with us at Stamping Sensations. Wow, love the vintage look to your creation. So many things to catch your eyes! Thanks for sharing on the Open-Minded Crafting Fun Challenge #29 - No Red and No Pink. Wow, wow, wow! You know how much I love your handmade flowers and these were actually made with a die that I have! Yay! :D I think it's time to get that die out and experiment a little with it. You've definitely inspired me to do so when I have some free time. Thank you for that! Your creation is beyond amazing. Beautiful Pamellia, gorgeous colour palette and those flowers are to die for! wow you flowers are gorgeous!! thanks for playing along at Open-Minded Crafting Fun Challenges! This is a work of art, I would not have the patience to put so much work into a card, but it is absolutely stunning. There are so many gorgeous elements on your card, but I particularly like what you have done with the butterflies. Thanks for joining us at Perfectly Rustics.